We stay here till it closes for lunch and then wander back to the Two Towers, stopping for another gelato pit-stop, for both kids and grown-ups.They didn’t used to have so many different flavours when I first came here, and it is just so much fun to try new ones. In theory I should go for the fruit ones because they’re ususally made from fresh produce on the premises, and have less calories. When you see those really really perfect looking creamy fluffy ice-creams, it’s actually not a good thing – the more perfect and fluffy-looking they are, the less likely it is that they’re made that morning on the premises. You can always ask. Just to the left of our landmark base (this is where we meet up if we get lost), the Two Towers, we veer up one of the tiny streets into what was once – and actually still is – the old food market, veggies and fruits and fish, and now there’s a lovely food hall here. But don’t let the word ‘market’ throw you off – this is where some of the most up-market clothes shops are too, (almost) right next to the fish stall! 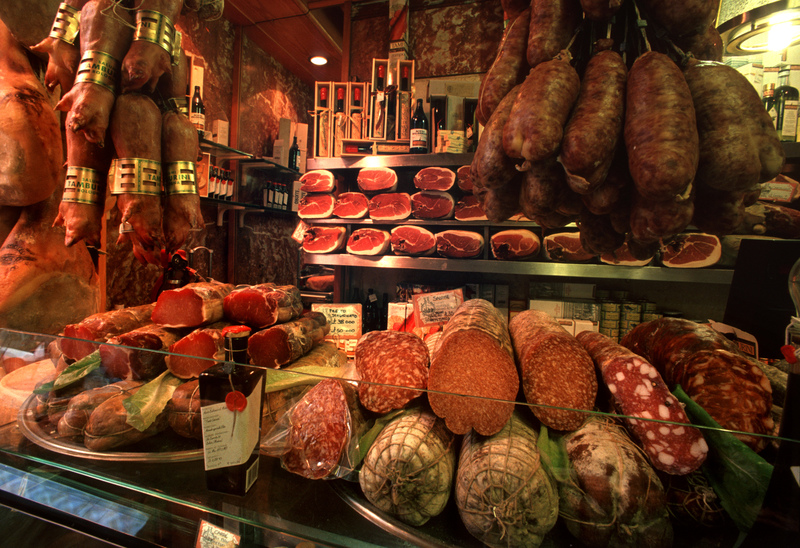 We window-shop in Tamburini, perhaps the best-known food shop, jam packed with all the most traditional foodstuffs from Bologna: tortellini, tortelloni, prosciutto, mortadella, all kinds of pasta shapes and colours. 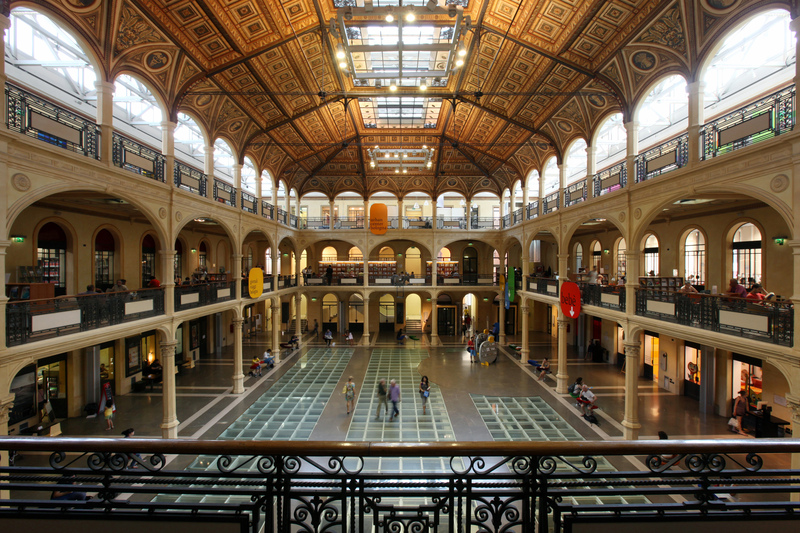 Then we ramble across the street to the bookshop-foodhall, built on the premises of a former cinema and before that an old church so that you can still see the original walls. An eating place on each floor, but it’s actually a bookshop… On the ground floor a cheese-salami theme and – book-wise – general best-sellers and coffee-table art books, first (or second if you’re American) floor a tiny restaurant with pasta dishes and great selection of niche food products (but kind of on the pricey side), and – again book-wise – literature and history. On the third floor more food and my favourite floor – very very good philosophy and history section and children’s books (or Stoppani down the street). What a wonderful combination. The only problem – and it’s a problem you’ll find all over the country – is that there aren’t really many books in English or in other languages; actually there isn’t really anything in English or other languages; that’s one of the things that makes this country a little difficult to navigate – and it’s a great idea to learn a bit of Italian! If you do make the effort to speak a bit, people are usually very helpful, but if they just hear English, they can become a bit defensive and sometimes seem a bit stand-offish, that might just be because it throws them a but to have to reply in a foreign language. The food halls, like other food halls in Italy is great, and great for “foodies”, food and wine experts, but what I love most about Italy is the ‘ old Italy’ that you find in homes (making pastas like tortellini is exhausting and time-consuming and people now do it less frequently), in the trattorie (simple restaurants), in the local coffee bars where you still find groups of elderly men will be playing cards, in the dozens of small village festivals in dozens of small villages all over the country, in food kiosks (now more trendily called streetfood), and especially my best friend from my first years in Italy — she was almost 90 years at the time; she used to tell me about her childhood in the Appeninenes in the first decades of the last century, about how it was growing up so poor that children were sent in the forest to collect wood barefoot, or with clogs, and how those children would sometimes get tetanus because the nails in the wooden clogs were rusty… I get teary when I think about her now, and especially when looking at photos of her and my daughter who was tiny then. 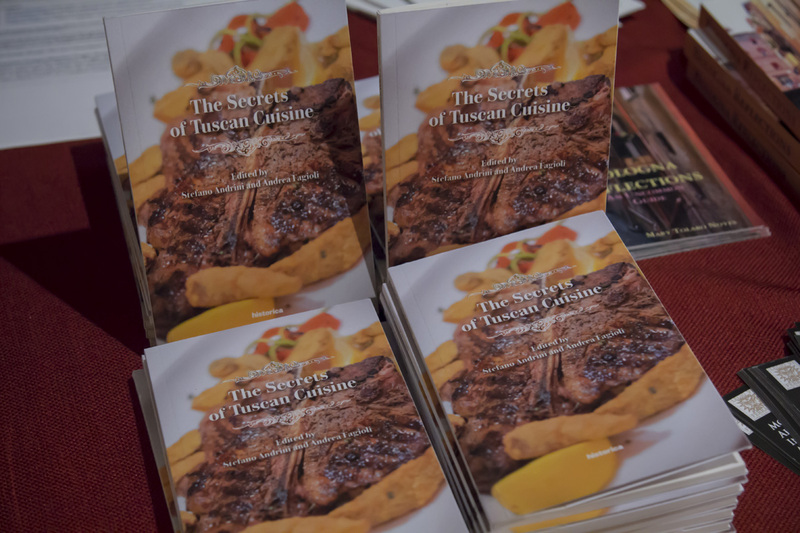 I learned a lot about Italy through her, things you don’t usually get to read about or hear about or see in tourist brochures, but I also learned a lot about food! 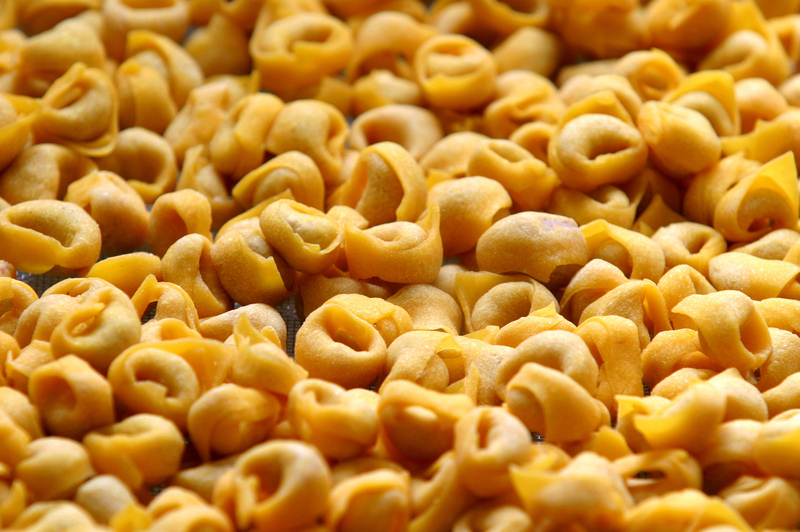 She used to cook passatelli (to this day my daughter’s favourite) and crescentine for us. It was a window into a world almost gone, but kept alive in the multitude of regional cooking traditions all over the country, different from place to place, season to season, festivity to festivity, family to family. Part 3 to follow soon! De pleide ikke å ha så mange forskjellige smaker når jeg først kom her, og det er morsomt å prøve nye. Teoretisk burde jeg velge frukt smakene fordi de er vanligvis laget av ferske råvarer I selve butikken, same dag, og har mindre kalorier. Når iskremen er virkelig perfekt, helt ‘fluffy’, det er faktisk ikke en god ting – jo mer perfekt de ser ut, jo mindre sannsynlig er det at de er laget om morgenen på stedet. Du kan alltid spørre! Like til venstre av de To Tårn, snur vi opp en av de små gatene i hva var en gang- og faktisk fortsatt er – det gamle matmarkedet, grønnsaker og frukt og fisk , og nå er det en smart matvarehall her. Men la ikke det ordet “markedet” sette deg på feil spor – dette er hvor noen av de mest luksus butikkene er også, ved siden av fiskebutikken! Vi titter henrykt i vinduene til “Tamburini”, kanskje mest kjente mat butikken i Bologna, fullpakket med alle de tradisjonelle matvarer spesielt fra Bologna: tortellini, tortelloni, prosciutto, mortadella, alle typer pasta former og farger. Så vandrer vi over gaten til en bokhandel-mathall, bygget på en tidligere kino, og før det, en gammel kirke slik at du kan fortsatt se de originale veggene (www.eataly.net og foto). Et spisested på hver etasje, men det er faktisk en bokhandel… På grunnplan finner vi en ost-spekemat spisested og I bokhandel avdelingen årets best-selgere og salongbord/kunst bøker, i andre etasje en liten restaurant med pastaretter og stort utvalg av nisje matvarer (ikke så helt billig dessverre), og I bokhandel avdelingen finner vi litteratur og historie. I tredje etasje mer mat og min favoritt etasje – filosofi og historie delen og barnebøker (eller Stoppani like ned veien er fantastisk, mye på engelsk). For en fantastisk kombinasjon. Det eneste problemet – og det er et problem du finner i hele landet – er at det ikke er veldig mange bøker på engelsk eller andre språk. Faktisk er det egentlig veldig lite engelsk eller andre språk; det er en av tingene som gjør dette landet en litt vanskelig å navigere – så det er en god idé å lære litt italiensk! Hvis du gjør en innsats for å snakke litt, er folk vanligvis svært hyggelige, men hvis ikke, kan bli litt defensiv og noen ganger virke litt arrogante, kan det være fordi de føler seg litt usikre. Denne mathallen, som andre mathaller i Italia er flotte, og flott for “foodies”, mat- og vin eksperter, men det jeg elsker mest om Italia er den ‘gamle Italia’ – i hjemmene, i trattoriene (enkle restauranter), i den lokale kaffe baren, i de uttalige små landsby festivalene i uttalige små lansbyer over hele landet, i matkioskene (nå heter det jo ”streetfood” er begynner aa bli veldig trendy), mine venner som lager pasta hjemme selv (det er ikke så mange igjen som gjør det, det er slitsomt og tidkrevende) og spesielt min beste venninde fra mine første år i Italia – hun var nesten 90 år allerede da – og fortalte om hennes barndom i Appeninene på 1920-tallet, hvordan det var å vokse opp så fattig at man gikk i skogen for å sanke ved barfot, eller med tresko – noen ganger fikk barn tetanus fortalte hun, fordi de brukte rustne spikre for å holde treskoene sammen. Jeg blir tåreaktig av å tenke på henne nå, og ser på bilder av henne og min datter som var bitteliten da. Jeg lærte mye om Italia gjennom henne, om det man ikke leser og ser og hører om til daglig, men jeg lærte også mye om mat! Excuse me, is there a bank nearby? Mi Scusi, c’è una banca qui vicino? Yes, there are many. Sì, ce ne sono molte. Which bank are you looking for? Quale banca cerca? You need to turn right. Deve girare a destra. The bank is next to the church. La banca è di fianco alla chiesa. I would like to change this check. Vorrei cambiare questo assegno. Are you a foreigner? Lei è un cittadino straniero? and your residence permit. e il suo permesso di soggiorno. A few days ago I went for a walk in Bologna with some friends visiting from Norway to show them what I like best about this city. I hadn’t done that for a while – shown Bologna to friends – and every time I do I am reminded of the wonderful things about this city. Living in a place, as a ‘local’ or as an ‘ex-pat’, one tends to grumble about the things that make daily life difficult and it’s easy to forget just what a unique city it is, and indeed what an extraordinary country this is. 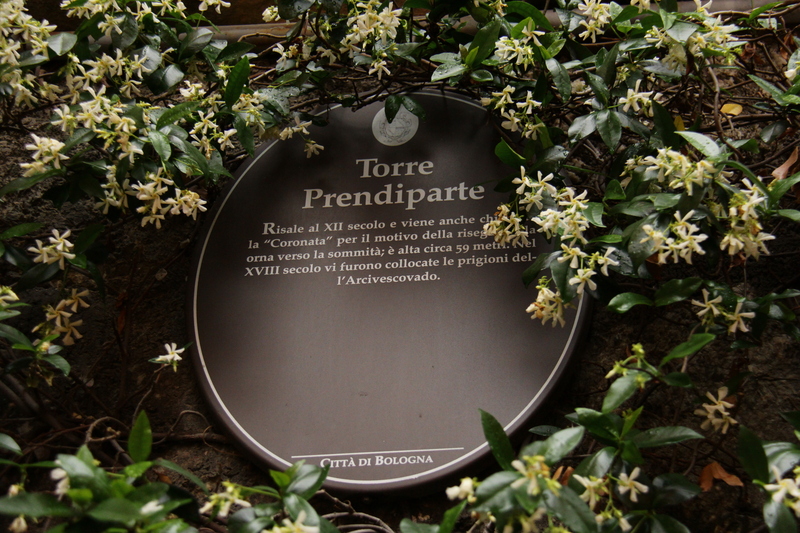 So let me tell you a little bit about our walk through the city, and share with you what it is I like best (and least!) about living here. The bus takes us straight to Bologna’s iconic landmark, the “Two Towers” , perhaps the best place to start. The children wanted to walk up to the top of the tower, where the view is fantastic, but the queue was long (it’s best to book online we were told). The grown-ups were a little less enthusiastic because it was a hot, hot day, and so that was saved for another day. My students tell me that climbing up the tower before an exam is bad luck, so mind you go up after you’ve finished your exams! We walk down Strada Maggiore, the street I take to go to work, we pass a gorgeous educational children’s toy shop (Città del Sole), and stop to look up at the medieval arrows stuck in the wooden ceiling, remnants of a time when each noble family in Bologna had their own tower and the ‘party-game’ of the time was to shoot down the neighbour’s tower – which is why there are only two left, but quite a lot of chopped-off ones that are interesting too and that one can visit (torre prendinparte). We wander through Corte Isolani and window shop a bit – Birkenstocks, expensive antiques, a couple of up-market restaurants discreetly and tastefully pocketed in this beautiful combination of old and new, what the Italians do best: 13th, 14th, 15th century walls, ceilings, doors, windows, antique objects perfectly blend in with the discreet and tasteful cratfsmanship of modern artifacts and materials. Corte Isolani takes us into my favourite-of-all places, the Santo Stefano complex and Piazza, or “7-churches” as it is also called, a small cobbled pavestone (not comfortable with heels…) with a cluster of churches, all built one on top of or next to the other. The oldest is from the second century, it’s my absolute favourite although there’s not much left of it, but you can still see the original (?) windows which are made of layers of coloured sand and also some of the original floor mosaics. My other two favourites are the round Roman church with a big pulpit smack in the middle, and then the cloisters, which has this beautiful still peaceful feel to it. There’s a little gift shop with lots of fun things as well as the usual stuff – jams and marmalades and honey – that the friars make themselves. Et par dager siden gikk jeg en tur i Bologna med noen venner på besøk fra Norge for å vise dem hva jeg liker best om denne byen. 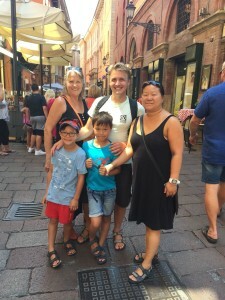 Det er lenge siden jeg har vært turist I min egen by og lenge siden jeg har vist Bologna til venner; hver gang jeg gjøre det blir jeg påminnet om de fantastiske tingene om denne byen. Når man bor på et sted, som en “lokal” har man en tendens til å klage om tingene som gjør daglige liv vanskelig og det er lett å glemme hvor unik byen – og landet – er. Så la meg fortelle deg litt om vår tur gjennom byen og dele med deg hva det er jeg liker best (og minst) om å bo her. Bussen tar oss rett til Bolognas landemerke, “To tårn” (www.duetorribologna.it), kanskje det beste stedet å begynne. Barna vil gå opp til toppen av tårnet, hvor utsikten er fantastisk, men køen var lang (det er best å bestille online ble vi fortalt). De voksne var mindre entusiastiske fordi det var en varm, varm dag; det ble til at dette prosjektet ma vente til en annen gang… Elevene mine fortelle meg at klatring opp i tårnet før eksamen er uflaks, så du gå når du er ferdig med eksamen! Vi går ned Strada Maggiore, gaten jeg tar for å gå til arbeid, vi passerer min favoritt pedagogisk barns leketøy butikk (Città del Sole), og stopper for å se på pilene fra middelalderen fast i tretak, rester av en tid da hver adelsfamilie i Bologna hadde sitt egen tårnet og “party-spillet” på tiden var å skyte ned naboens tårn – det er hvorfor det er bare to tårn igjen…). Det er mange av disse kortere tårnene igejn som man kan besøke, eller til og med sove i! 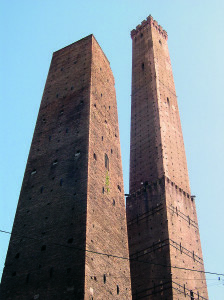 (via Albirolo). Vi vandrer gjennom Corte Isolani (www.corteisolani.it) og i butikk vinduer ser vi Birkenstocks, kostbare antikviteter, et par dyre restauranter – alt dette diskret og smakfullt plassert i en vakker kombinasjon av gammelt og nytt. Dette er hva italienerne gjør best: antikke vegger og tak, dører, vinduer, antikke gjenstander som blander seg perfekt med den diskret og smakfulle håndverk av moderne gjenstander og materialer (lenke, fokus på gamle døren ny mur). Corte Isolani tar oss til min favoritt-til-alle steder, Santo Stefano komplekset, eller “7-kirkene” som det kalles også, en liten brosteinsbelagt piazza (ikke komfortabel med hæler…) med en klynge av syv kirker, bygget oppå eller ved siden av hverandre. Den eldste er fra det andre århundre, det er min absolutte favoritt, selv om det ikke mye igjen av det, men du kan fortsatt se de opprinnelige vinduene som er laget av lag med farget sand; og også noen av de opprinnelige gulvet mosaikker. Mine to favoritter er den runde romerske kirken med en stor prekestolen klask i midten, og deretter klostrene, som har en spesiell og fredelig stemning. Det er en liten gavebutikk med masse moro ting I tillegg til alt det vanlige – syltetøy og marmelade og honing som munkene lager selv. Vi blir her til det stenger til lunsj og deretter vandrer vi tilbake til de To Tårnene, stopper for neste gelato stoppested, for både barn og voksne. What’s your name? Come ti chiami? My name is ____. Mi chiamo, ___. Nice to meet you. 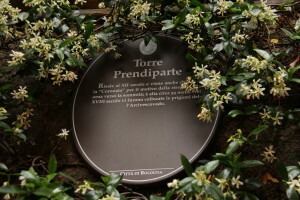 Piacere di conoscerti. If you want to eat at the bar, ask for permission to the waiter (cameriere) first. If you don’t know what to eat, ask for the menu (menù). 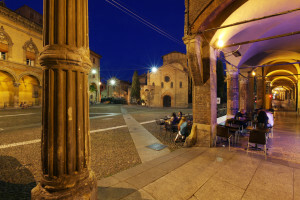 After the work, people usally go to the bar for an aperitif (aperitivo) before having a meal at home. 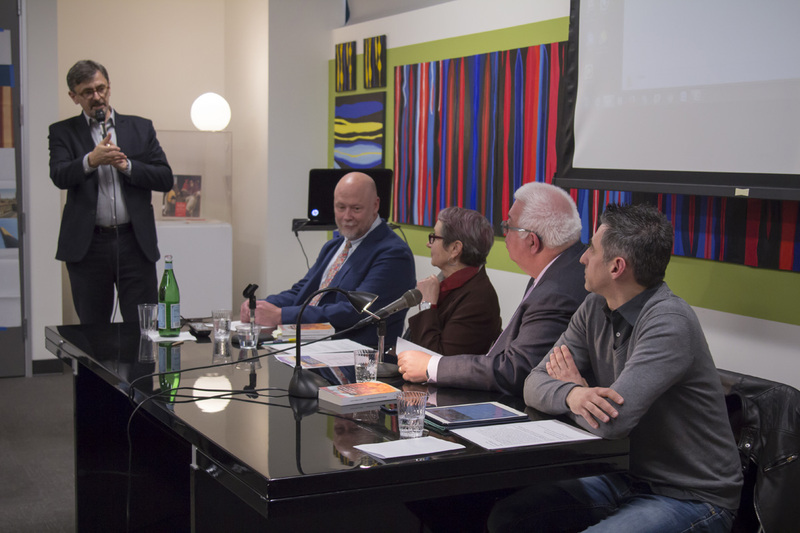 “Colpa” di due libri sui segreti delle rispettive cucine regionali presentati il 5 aprile nella prestigiosa sede dell’Istituto di italiano di cultura promotore dell’evento. 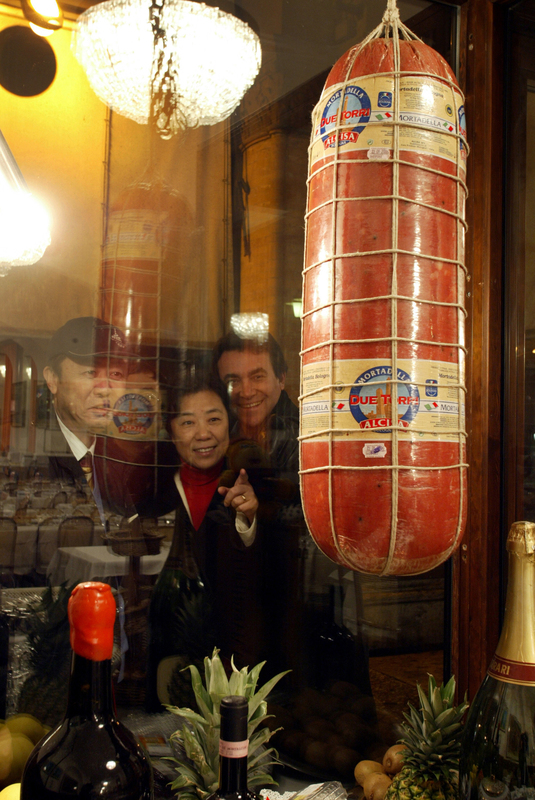 Al giornalista Stefano Andrini, curatore dei volumi (il secondo insieme al collega Andrea Fagioli), il merito di aver ideato un evento dalle caratteristiche decisamente inusuali. Fin dall’inizio di questo percorso Andrini si è avvalso della preziosa collaborazione di Bologna Connect e in particolare di Laura Bizzari e Antonella Orlandi, che vantano ormai una lunga esperienza nell’organizzazione di iniziative culturali in terra americana (e non solo). 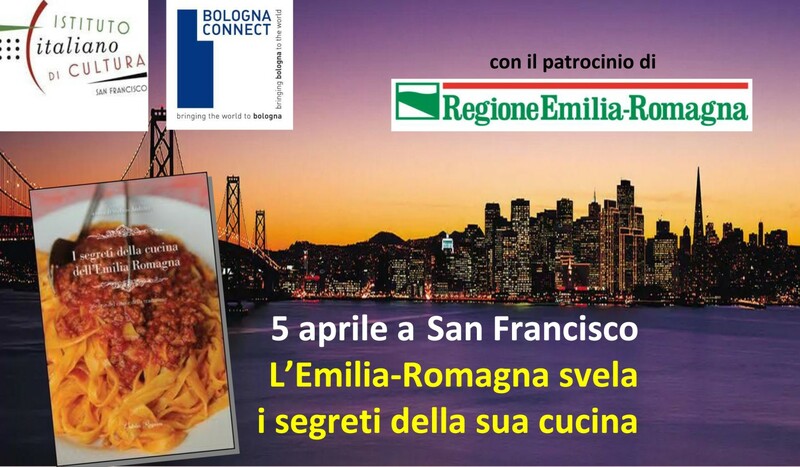 L’evento, che ha avuto anche il patrocinio della Regione Emilia Romagna, è stato coronato da un successo straordinario e inaspettato. Un folto pubblico ha riempito la sala incontri dell’Istituto italiano di cultura per assistere al dialogo tra Mary Tolaro-Noyes, ambassador di Bologna Connect e Stefano Andrini. Le sorprese non sono mancate. A cominciare dai video originali (regista Federico Formigoni) scelti per intervallare la presentazione e sottotitolati in inglese da Enrica Nicoli Aldini, una ragazza bolognese ormai trapiantata negli Stati Uniti. 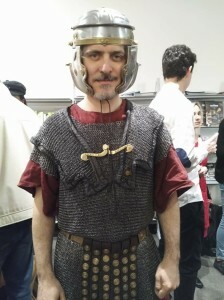 Sullo schermo della sala le immagini sono scivolate via accolte con stupore e divertimento dal pubblico: la sfida estrema della Tagliatella Band con un remake di un celebre canto natalizio hawaiano; la performance di Alessandro Di Leva che nei panni di un legionario romano racconta gli antenati della piadina; l’esilarante monologo del comico Paolo Cevoli (applauditissimo) che ha provato a spiegare agli americani perché la Romagna è devota al maiale, l’aneddoto raccontato dallo chef del Grand Hotel di Rimini Claudio Di Bernardo a proposito di quella volta che Sharon Stone preferì alle ostriche un piatto di spaghetti aglio olio peperoncino. Fino alla spruzzata finale dell’agrifolk delle toscanissime De’ Soda Sisters. 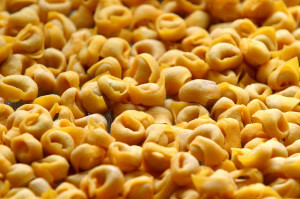 Tantissimi i temi emersi nel dibattito: l’esistenza o meno degli spaghetti alla bolognese; perché il destino di ogni tortellino che si rispetti è il brodo e non la panna, la perpetua che dalla finestra della Sala della Musica di San Petronio controllava il momento giusto per buttare giù la pasta. Terminato il video del legionario romano, come in un classico film americano dove l’attore esce dallo schermo, è spuntato tra il pubblico accompagnato da Francesca Pivi vestita da matrona romana. E qui è scattata la standing ovation. Il blogger David Scott Allen che nel libro ha intervistato Sting e sua moglie sulla loro factory toscana. Infine dalle parole ai … piatti. 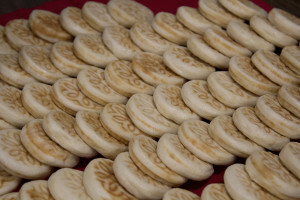 Precedute dalla candid camera sulla preparazione di crescentine e zuccherini Bianca e Anna dell’Albergo Villa Svizzera di Vidiciatico hanno offerto una degustazione di tigelle con farcitura d’ordinanza. La tasting è proseguita con le specialità dolciarie di Babbi. E gli insuperabili vini dell’azienda Tre Monti di Imola. Squadra che vince non si tocca. 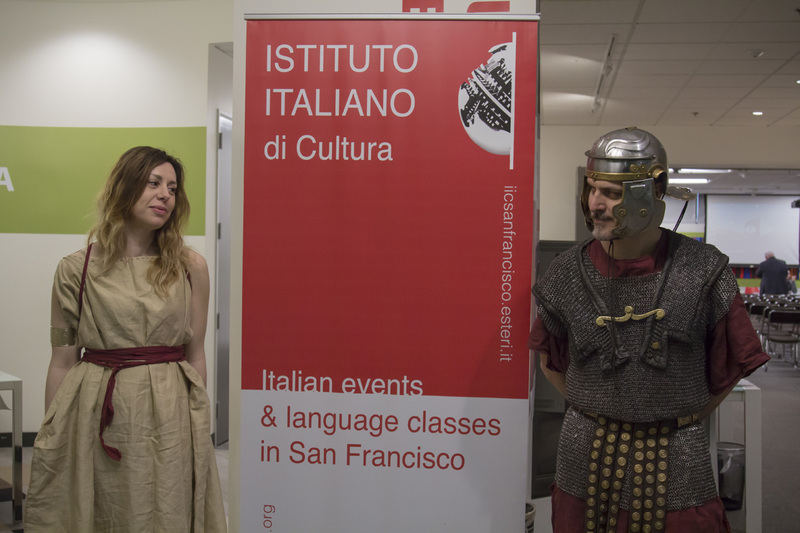 Ed è già pronta a ripartire su nuove rotte: per far conoscere anche in altri porti il format sperimentato con successo a San Francisco. 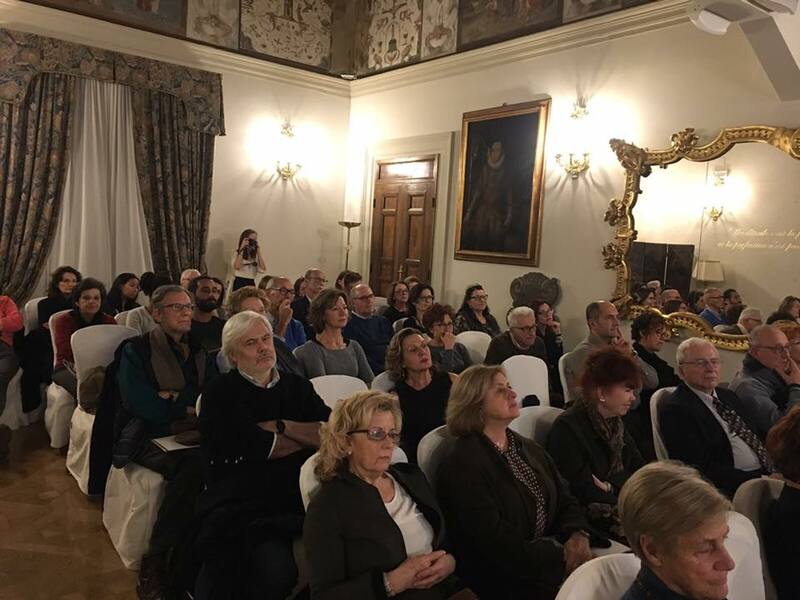 On Sunday, November 26, the wonderful setting of the Grand Majestic Hotel già Baglioni in Bologna hosted the presentation of the book, Sicily: A Journey of Discovery, promoted and organized by Bologna Connect. The cofounder of the association, Antonella Orlandi, spoke about the commitment of Bologna Connect in the promotion and enhancement of the territory; the translator of the book, Lucia Scigliano, described her emotion in recounting her home region through a foreigner’s eyes; and of course the author Mary Tolaro Noyes, moved the audience with anecdotes and images of her Sicilian family’s origin. 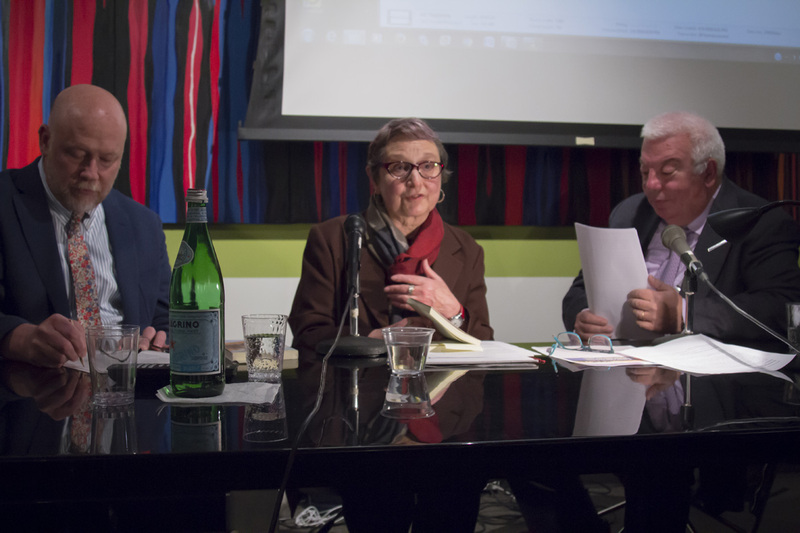 Already the author of books Bologna Reflections and Gathering Chestnuts and ambassadress of Bologna Connect in San Francisco, Mary Tolaro Noyes told of her love and curiosity for the city of Bologna and for Sicily and of the similarities and differences between the two regions. 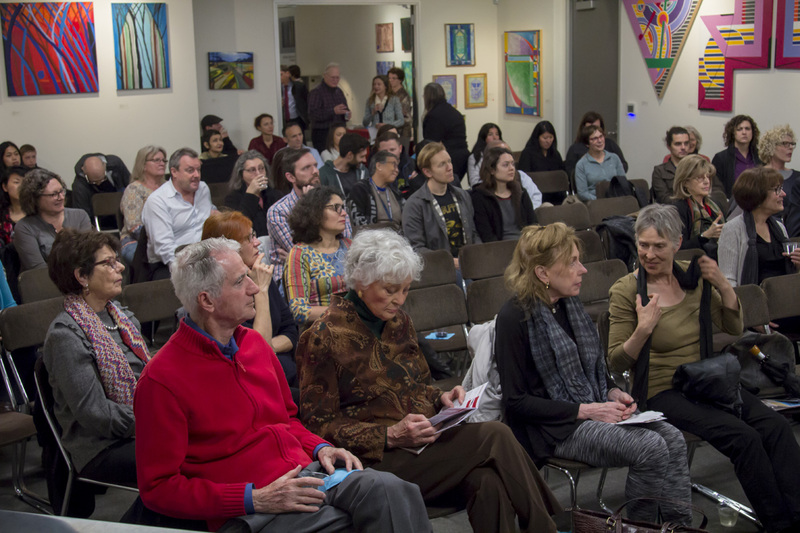 The journalist and writer Stefano Andrini, who masterfully captured the audience’s attention with humorous and at times stirring anecdotes, coordinated the meeting. We thank the Director of the Grand Hotel Majestic Tiberio Biondi for providing the lovely venue for our event. 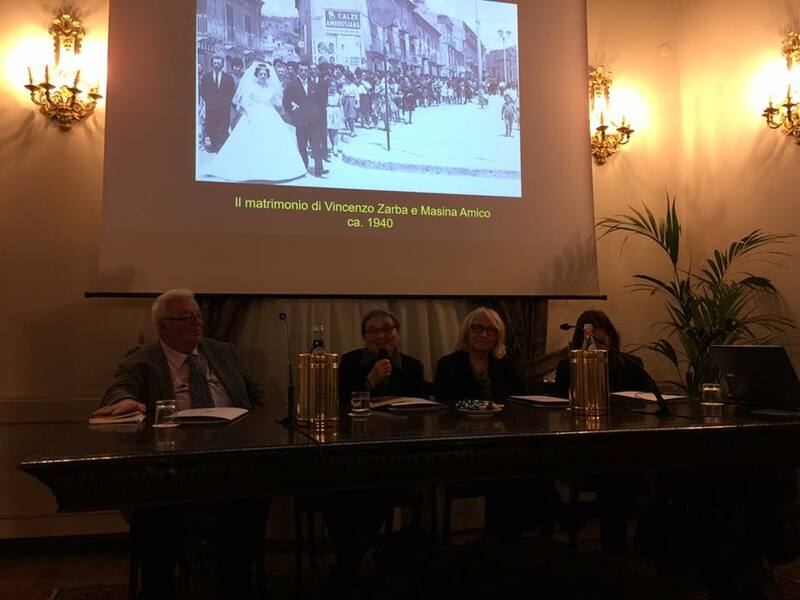 Domenica 26 novembre, la meravigliosa cornice del Grand Hotel Majestic già Baglioni di Bologna ha ospitato la presentazione del libro Sicilia: un viaggio verso le radici, promossa ed organizzata da Bologna Connect. 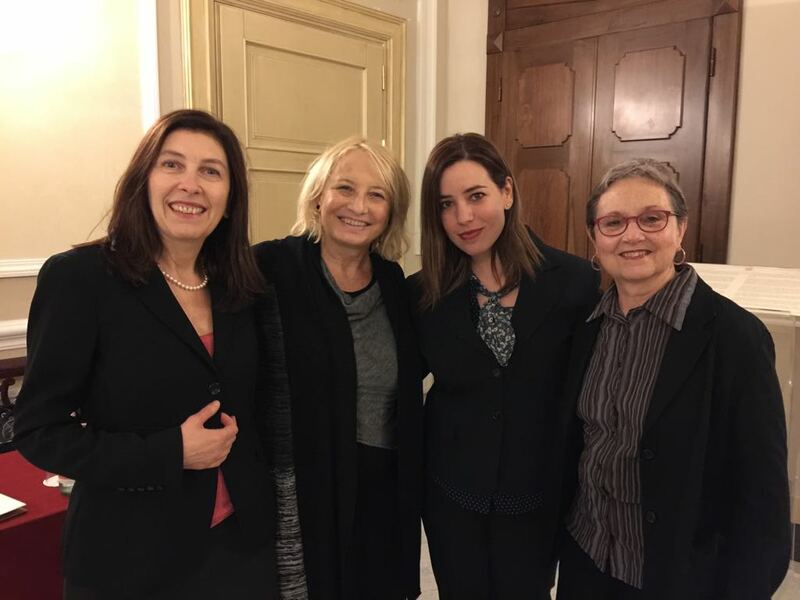 Sono intervenute la cofondatrice dell’associazione Antonella Orlandi, che ha raccontato l’impegno di Bologna Connect nella promozione e valorizzazione del territorio, la traduttrice del libro Lucia Scigliano, che ha spiegato l’emozione di raccontare la propria terra attraverso occhi stranieri e, naturalmente, l’autriceMary Tolaro Noyes, che ha emozionato il pubblico con aneddoti e immagini della sua famiglia d’origine siciliana. Già autrice dei libri Bologna Reflections e Gathering Chestnuts e ambasciatrice di Bologna Connect a San Francisco, Mary Tolaro Noyes ha raccontato del suo amore infinito e sempre curioso per la città di Bologna e per la Sicilia e delle similitudini e differenze tra le due terre. L’incontro è stato coordinato dal giornalista e scrittore Stefano Andrini, che con maestria ha rapito il parterre con note dal sapore divertente, ma soprattutto molto emozionante. Si ringrazia il Direttore dell’Hotel Tiberio Biondi per l’incantevole location messa a disposizione. 26 Kasım Pazar günü, Bologna’da ki Grand Hotel Majestic gia Baglioni’nin görkemli konferans salonu, Bologna Connect tarafından desteklenen ve düzenlenen Sicilya Köklere Doğru Yolculuk kitabının sunumuna ev sahipliği yaptı. Derneğin kurucu ortaklarından Antonella Orlandi, Bologna Connect’in bölge adına verdiği iyileştirme ve geliştirme konusundaki çabalarından bahsetti. Kitabın çevirmeni Lucia Scigliano, kendi memleketini yabancıların gözleri önüne sererken ki duygularını aktardı. Ardından kitabın yazarı Mary Tolaro Noyes seyircilere, Sicilya kökenli ailesinden fotoğraflar sergiledi ve anektodlar anlattı. Daha önce Bologna Reflections ve Gathering Chestnuts kitaplarını da yazmış olan ve BolognaConnect’in San Francisco temsilciliğini yapan Mary Tolaro Noyes, Bologna’ya ve Sicilya’ya olan sonsuz gönül bağını, bitmek bilmeyen merakını; bu iki şehrin benzerliklerini ve farklılıklarını anlattı. Gazeteci ve yazar Stefano Andrini, kitaptan bir takım anektodlar anlatırken, yaptığı espirilerle dinleyicileri gülmekten kırıp geçirdi, heyecanlı uslubuyla dinliyicilerin dikkatini ustalıkla çekmeyi başardı. Grand Hotel Majestic’in direktörü Tiberio Biondi’ye, bu muhteşem salonu etkinliğimiz adına sağladığı için çok teşekkür ediyoruz. 11 сарын 26ны ням гарагт, Болонья хотын Гранд Мажестик зочид буудалд Сицилийн тухай нэгэн номын нээлт боллоо. 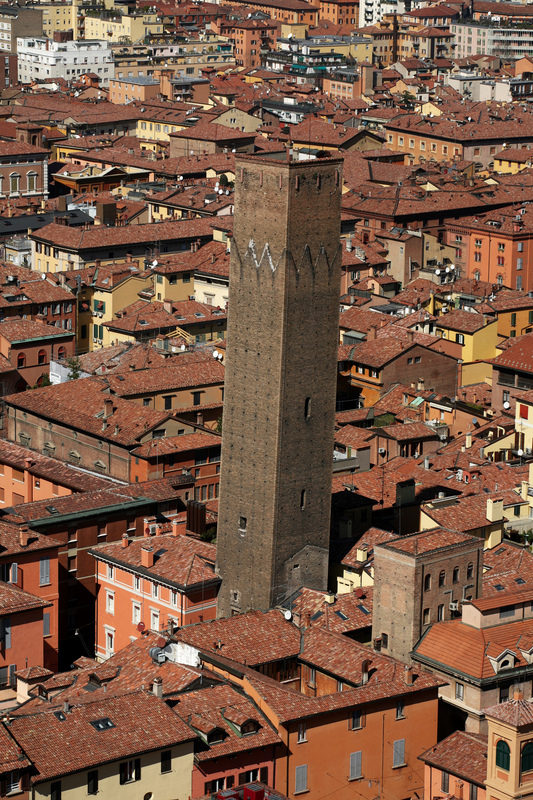 Өв уламжлалынхаа зүгт хэмээх энэ номын нээлтийг Bologna Connect холбооноос зохион байгуулсан юм. Холбооны үүсгэн байгуулагч Антонелла Орланди үйл ажиллагааныхаа тухай товч танилцуулж, номын орчуулагч Лучиа Шиллиано эх нутгийнхаа тухай гадны өнцгөөс харж илэрхийлэх ямар байсан тухай ярилцав. Мөн номын зохиогч Мэри Толаро Ноеэс сициль нутгаас гаралтай гэр бүлийнхнийхээ тухай сонирхолтой түүх, хуучин зурагнуудаасаа хуваалцлаа. Болоньягийн тусгал, Туулайн бөөр цуглуулах нь хэмээх номнуудын зохиогч, Bologna Connect төвийн Сан Франциско хот дах төлөөлөгч хатагтай Мэри Толаро Ноеэс Болонья хотод бас Сициль аралдаа хайртай гээд энэ хоёр газрын ялгаатай, адил талуудыг нь мөн дурдав. Зохиолч, сэтгүүлч Стефано Андрини энэ уулзалтыг зохион байгуулахад чухал үүрэг гүйцэтгэсэн бөгөөд тэрээр танхимд хөгжилтэй уур амьсгал нэмж байсан юм. Эцэст нь гайхалтай орчинд энэ уулзалтыг хийх боломж олгосон зочид буудлын удирдлагад баярлалаа. If you ask an Italian passionate what his biggest dream is, he would probably say “living like an Italian”. 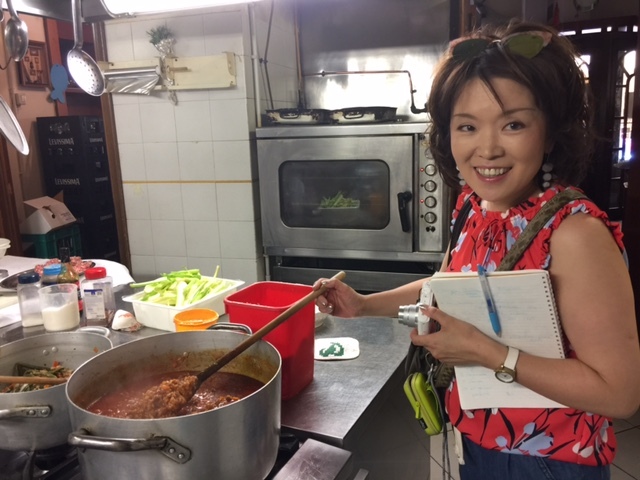 Well, with Love Italian, a personal teaching Italian experience, last week this dream came true for a Japanese woman who spent 7 days living, speaking and eating like an Italian, exploring the beautiful area in and around Bologna and making wonderful experiences with local people. Izumi Kato is a 52 year old hairdresser from Japan with a big passion for the Italian language and culture. In the past, this love for Italy led her to visit several cities such as Venice, Florence, Rome and Naples, but this time Izumi wanted a different, less touristy experience. In fact, her purpose was coming to Italy again not only to travel and explore as a tourist, but first of all to study the Italian language, to sink into the Italian culture and live the country like a local. 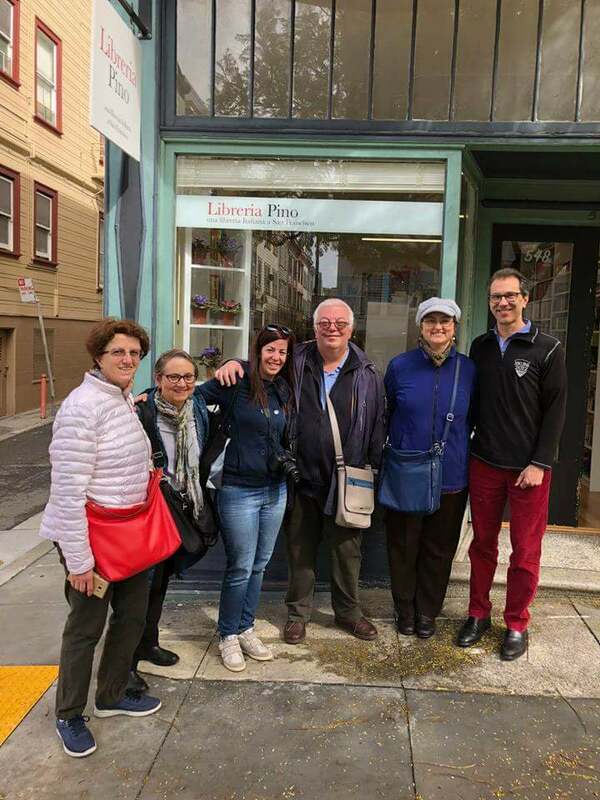 It can seem impossible, especially if you don’t have any Italian friend and if your Italian knowledge is basic, , but actually, thanks to Love Italian and its professional and well-connected teachers, it was possible for Izumi to enjoy this experience. 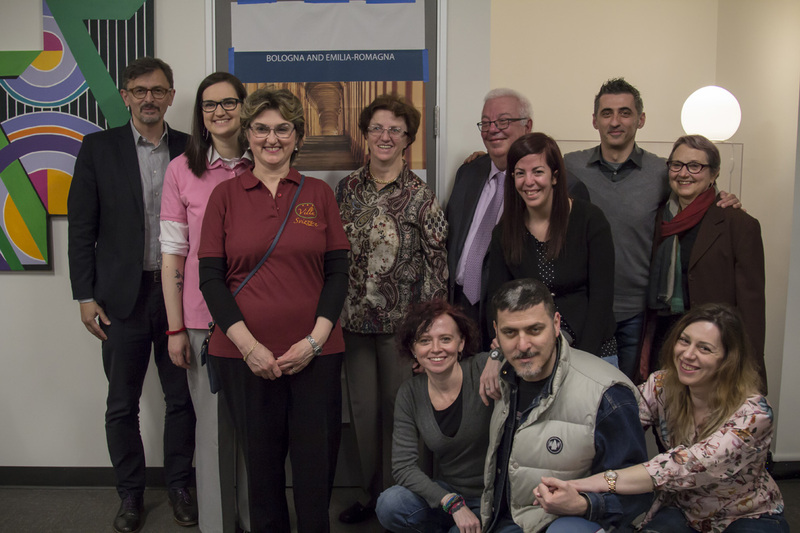 Love Italian provides intensive tailor-made individual Italian courses with personal Italian native speaker tutors who live with you for the whole period of your stay, showing you the Italian life-style and travelling with you. Izumi had the luck of joining this project and live for one week with her tutors and teachers, the careful Laura Bizzari and Antonella Orlandi. They were also supported by other helpful collaborators who assisted them in the project and helped them to drove Izumi into the Italian life style. 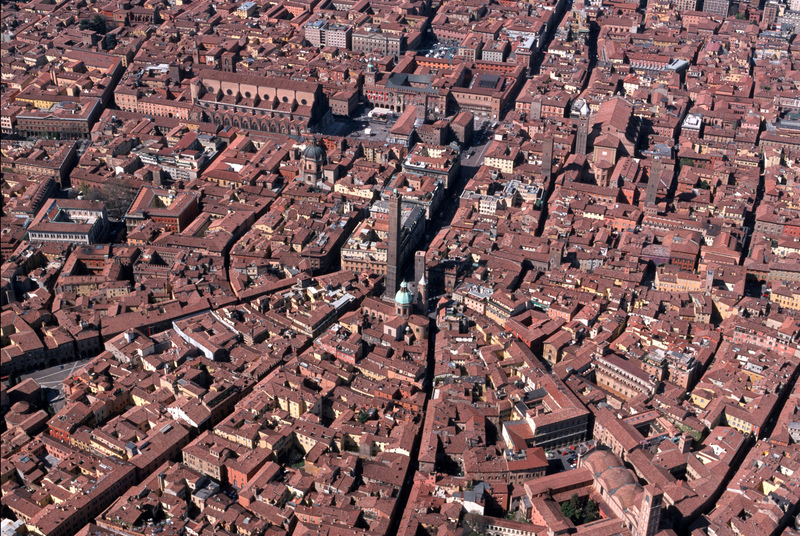 Together they explored the beautiful city of Bologna, tasting the real traditional food and making real experiences. 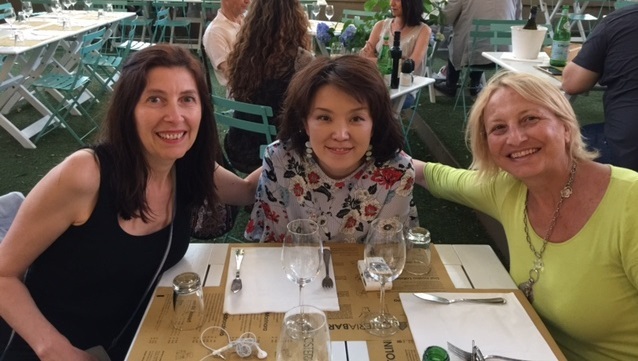 Going around with Laura and Antonella, Izumi had the opportunity of seeing Bologna from the perspective of a local, enjoying the Italian habits and discovering the beautiful atmosphere you can breathe drinking a glass of good wine in company of new friends. 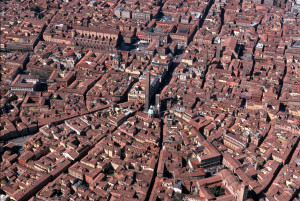 They also showed Izumi the amazing area around Bologna, taking her out of the bitten tracks that tourists are used to following when in Italy. 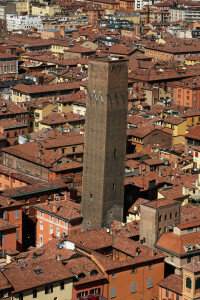 Under the advice of her teachers, Izumi made up a personal travel plan visiting Modena, Ferrara and Ravenna. They also spent one day in the thermal baths of Salsomaggiore. This way she could always understand the beauties that surrounded her. In fact, travelling through a country with locals always gives you a more complete view over the things you see and the reality you’re facing. 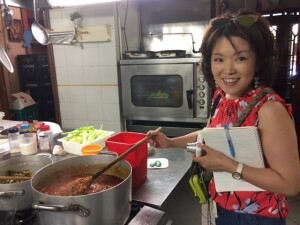 She also attended cooking classes, visited a really famous traditional balsamic vinegar farm, and had dinner with locals, having the opportunity of socializing. When visited the Trattoria Annamaria, she met the staff there, she talked to the famous Annamaria, discovering the secrets of the handmade fresh pasta and tasted all the delicious typical dishes you can find there. She also met an Italian hair-dresser and they talked a lot sharing their professional experience. Now she doesn’t only have a strong a passion for Italian culture, but she also has memories, friends, people who are glad to keep in touch with her and would love to see her again. 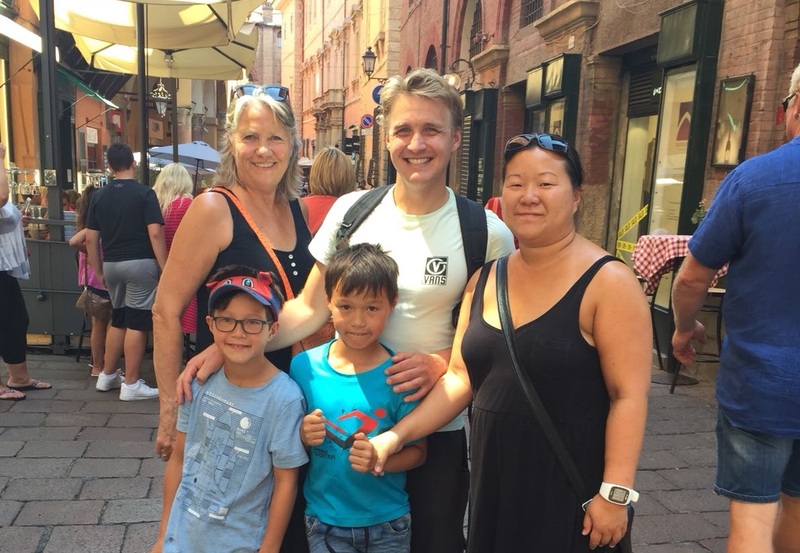 Meeting locals gave her a really different approach to the Italian language: she had to push herself to improve her speaking and listening skills in order to communicate with other Italian people. Laura and Antonella where always careful and present to help her to understand, but also really strict as they always spoke with her in Italian. Despite the difficulties, she learned a lot. She did something really different from a normal Italian course: she had a rare experience meeting people, discovering the beauties of Italy and living like an Italian while learning the language. She won’t easily forget all the people she met and all the things she saw. When leaving she was so sad and touched, she said she will come back next year to improve her Italian skills and meet again all the people that make her experience unforgettable. Looking forward to seeing you again dear Izumi!